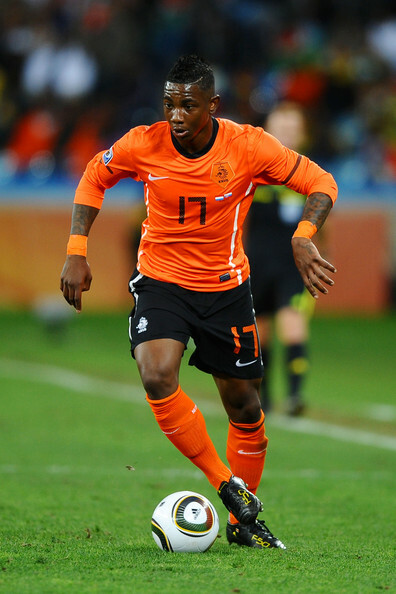 Liverpool’s search for new players who will help to keep Roy Hodgson’s job safe has begun, as the Reds have reportedly agreed terms with Dutch winger Eljero Elia. Elia has been linked with Liverpool for a while, but up until now it has only been rumours. Now, it looks as if the rumours are finally coming true, as sources in Germany- home of his current club Hamburg, suggest that the pacey winger has been subject to a £13 million bid from the Merseyside club and have agreed personal terms with the 23 year-old. Elia would be a ideal addition to the Liverpool side who massively lack natural wingers and players who are actually willing to play on the wing. Joe Cole has again expressed his desire to hold a central attacking role in the Liverpool side, and with Babel also preferring a central role, Hodgson knew he needed a natural wide man. The team have also lacked creativity and pace and after seeing Elia in the World Cup for Holland, he certainly has pace in abundance and the ability create chances for his team mates. Elia has scored a career total of 27 goals while mounting a good assist total of 22, and in 2009 was awarded the Johan Cruijff Award for “Young Player of the Year” in the Netherlands – an award that has previously been won by Arsenal legends Dennis Bergkamp and Marc Overmars as well as Robin van Persie, Arjen Robben and Rafael van der Vaart. He will have to play much better than he has in Germany that’s for sure! That’s why they are letting him be sold! Potential is not always enough, Babel is a case in point, no? Hodgson will play hom out of position .. He is not a player, who is going to bring consistent quality, neither he is going to be more effective in the personal outplaying of opponents than Babel does. Much possible waste of funds. negative negative negative. So used to dissapointment that your already writing the skysports headlines. He, to me looks like a top talent and would be ideal for us, his ball control compare to babel is much better, the left winger we’ve been crying out for. Also mertascker would be sweet but think this might be paper talk. left back for sure, not sure who tho…anyone know how insua’s doin on loan? Brilliant signing if we get him, just 23 he will light up our team with pace and finally a player who takes defenders on and take players out of position to create more room for strikers and gerrard. Our current slow passing game ain’t good enough for EPL. buy him!!!!!!!!!!! !